Only about 1 percent of the human genome encodes proteins, and researchers have long debated what the other 99 percent is good for. Many of these non–protein coding regions are known to contain important regulatory elements that orchestrate gene activity, but others are thought to be evolutionary garbage that is just too much trouble for the genome to clean up. 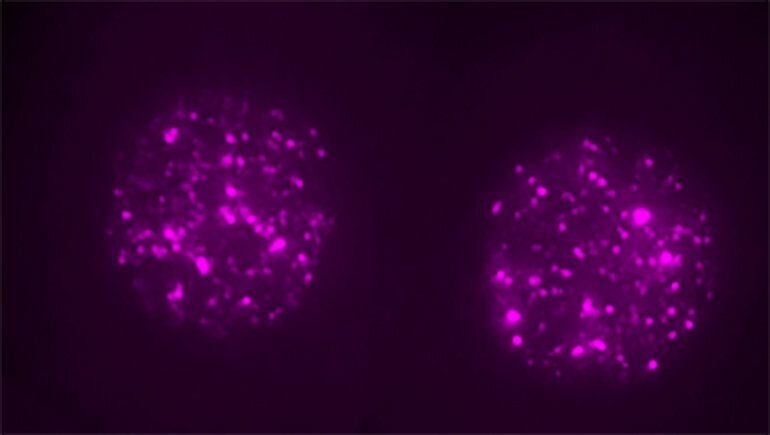 Now UCSF scientists have revealed that, far from being a freeloader or parasite, the most common transposon, called LINE1, which accounts for fully 24 percent of the human genome, is actually necessary for embryos to develop past the two-cell stage. Study senior author Miguel Ramalho-Santos, Ph.D., an associate professor of obstetrics/gynecology and reproductive sciences and a member of the Eli and Edythe Broad Center for Regeneration Medicine and Stem Cell Research at UCSF, has been interested in transposons since he first set up his lab as an independent UCSF Fellow in 2003. The project took off when Michelle Percharde, Ph.D., joined the lab as a post-doctoral researcher in 2013 and was quickly caught up in Ramalho-Santos's enthusiasm for the LINE1 paradox. "When I saw all the LINE1 RNA that's present in the nucleus of developing cells, I agreed there must be some role it's playing," Percharde said. "Why let your cells make so much of this RNA if it's either dangerous or doing nothing?" Further experiments revealed that although the LINE1 gene is expressed in the early embryo and stem cells, its role is not to insert itself elsewhere in the genome. Instead, its RNA is trapped within the cell nucleus, where it forms a complex with gene regulatory proteins Nucleolin and Kap1. This complex is necessary to turn off the dominant genetic program that orchestrates embryos' two-cell state—controlled by a gene called Dux—and to turn on genes that are needed for the embryo to move on with further cell divisions and development.